This is one of the Azhwar Nava Tirupathi. Kubera who lost the Nava Nidhis (nine types of wealth) due to a curse of Parvati, prayed to the Lord here. The Lord appeared and restored the wealth to Kubera. At the request of Nava Nidhis, the Lord accepted the name Nikshepavvitthan (Vyttha Manidhi). This place is also called the Adharma Pishunam as Dharma( who resides here praying the Lord ) defeated Adharma. The Lord is in Bhujanga sayanam with his head supported by his left hand as if he is looking at us.This is the avatara sthalam of Madurakavi azhwar.Swami Manavala Mamunigal has composed a mangalasasanam for this kshetram.No facilities are available for staying here. 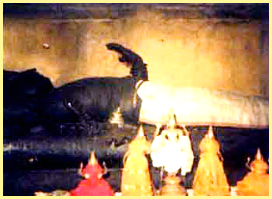 Due to a curse by Parvathi Kuberan lost his nava nidhis (Nine types of wealth) Kuberan meditated on the lord and got blessed by the perumal of this divya desam , who restored the navanidhis and so the Lord become the Vaittha maa nidhi (Nikshepa Vitthan ) and Kuberan obtained Saapa-vimochanam (was freed from the curse) . This sthalam is also known as adharma pisunam since Dharmarajan(who lives here) won in a battle with Adharmam here .Nammazhwar has described this kshetram as the shining star on the forehead of the Southern direction (Then-thisaith thilada manaiya thirukko loorrkke) in his 6 pasuram of his aaram pathu. Theertham - Kubera Theertham, Thamirabarani river. The Kshetra is the Avathara Sthala of Madura Kavi Azhwar. The Lord is in the posture of having risen His left hand towards His right hand. The divine meaning of this posture could be attributed to the Lord having donated all His wealth to Gubera and reaching and searchinng towards it. Access to the temple About 2 to 4 Kms Near AzhwarthiruNagari. The Moolavar of this Sthalam is Vaitha Maanitha Perumal. Also called as "Nishopavitthan". Moolavar in Kidantha kolam in Bujanga sayanam facing East direction. Prathyaksham for Guberan and Madhurakavi Alwar. This sthalam is situated in Tirunelveli district near Azhwar Tirunagari. Two miles away from Azhwar Tirunagari. No lodging facilities available. This sthalam is one of Nava Thirupathi.